Divergent is the debut novel of American novelist Veronica Roth, published by Harper Collins Children's Books in 2011. The novel is the first of the Divergent trilogy, a series of young adult dystopian novels set in a Divergent Universe. The novel Divergent features a post-apocalyptic version of Chicago and follows Beatrice "Tris" Prior as she explores her identity within a society that defines its citizens by their social and personality-related affiliation with five factions, which removes the threat of anyone exercising independent will and re-threatening the population's safety. Underlying the action and dystopian focused main plot is a romantic subplot between Tris and one of her instructors in the Dauntless faction, nicknamed Four. The novel has been compared to other young adult books such as The Hunger Games and The Maze Runner because of its similar themes and target audience. In particular, the novel explores the themes common to young adult fiction, such as adult authority and the transition from childhood to maturity, as well as such broader motifs as the place of violence and social structures within a post-apocalyptic society. Its major plot device, the division of society into personality types, is one used in other science fiction works. Beyond its literary context, Roth's open declaration of her religion as a Christian has brought commentary from Christian communities both endorsing and challenging the novel. Roth wrote Divergent while working on a Creative Writing degree at Northwestern University, and it was quickly purchased for publication alongside the subsequent books in the trilogy (completed in October 2013). Summit Entertainment purchased the media rights to the book in 2011 and subsequently produced a film adaptation titled Divergent which was released March 21, 2014. The film, a success amongst audiences, generated $288,747,895 at the box office despite mixed reviews from critics. Roth (pictured) wrote the first draft of Divergent while on winter break from Northwestern University. 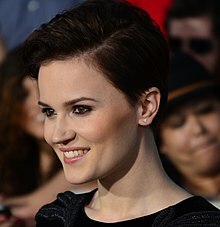 The novel is Veronica Roth's debut novel and was published a little over a year after Roth graduated with a Bachelor's degree from the Creative Writing program at Northwestern University. Roth wrote the novel during her senior year winter break and sold movie rights to the novel before she graduated. She had been working on the series from Four's point of view but decided that he was not the character she wanted for her series. Four years later, she decided to pick up the novel from a different point of view. Roth wrote the series from Beatrice's point of view. Tris was the right character Roth wanted to be the main character of her novel. Four still remained in the series and we find more deep secrets about him. I wrote the rough draft and I felt like it needed a more grounded sense of place, and I looked at the city I had described, which is all these trains constantly moving, and this lake marsh, and these rivers. And I realized that it was Chicago already, and it was just because that's the city I've known and loved the longest. In post-apocalyptic Chicago, survivors are divided into five factions: Abnegation, the selfless; Amity, the peaceful; Candor, the honest; Dauntless, the brave; and Erudite, the intelligent. All sixteen-year-olds are tested to determine which faction they are best suited for, but select their own faction at the Choosing Ceremony. Those who do not complete initiation become "factionless,” living on the streets. Sixteen-year-old Beatrice Prior feels she does not belong in her Abnegation family. Her inconclusive test results mark her as “Divergent,” and the test administrator Tori warns her never to tell anyone. Agonizing over her future, Beatrice decides to leave Abnegation and join Dauntless. Her brother Caleb chooses Erudite. The new Dauntless initiates jump onto a moving train to Dauntless headquarters, and are instructed to jump onto the roof. Most make it, but one initiate falls to her death. They are then ordered to jump into the compound entrance; Beatrice jumps first. Reaching the bottom, she tells the instructor Four that her name is Tris. Four explains that, unlike the other factions, who accept all successful initiates, only the top ten Dauntless initiates will stay while the rest become Factionless. Tris befriends several fellow initiates, but comes into conflict with others. The Willis (or Sears) Tower, one of several landmarks Roth describes within post-apocalyptic Chicago, the novel's setting. In the first stage of initiation, they are trained in guns, knives and hand-to-hand combat. Despite her lack of physical strength, Tris finishes in sixth place. A relationship emerges between Tris and Four, and Tris is pummeled by Peter in a fight. After the Stage 1 rankings are announced, the second-place Peter stabs first-place Edward in the eye. Edward leaves to become Factionless, followed by his girlfriend Myra. On Visiting Day, Tris learns that her mother was originally Dauntless. Erudite stirs dissent against the city's Abnegation leadership and accuses their leader Marcus of abusing his son. The rumors are fueled by the fact that Marcus' son, as well as Tris and Caleb, all left Abnegation, which is also alleged to be hoarding supplies. The initiates enter Stage 2, facing hallucinations based on their deepest fears. Tris' Divergent abilities give her an advantage and earn her the top rank. Peter, Drew, and Al attack Tris, threatening sexual assault and nearly throwing her to her death, but Four intervenes. Al begs Tris’ forgiveness, but she rejects him; he later commits suicide. The final stage gathers the initiates’ fears into a simulated “fear landscape,” testing their acquired skills. Tris and Four grow closer, and he lets her into his own fear landscape; she discovers he has only four fears, hence his nickname. She also learns he is Marcus' son Tobias, and the claims of abuse were true. Four uncovers Erudite's plans to use Dauntless to stage an attack on Abnegation. Tris overcomes her fear landscape, and the Dauntless initiates are injected with a "tracking" serum. Tris shares her feelings for Tobias, and is ranked first at the initiation ceremony. A junction on the Chicago "L", one of modern Chicago's train systems. Dauntless demonstrate their fearlessness by jumping on and off moving trains throughout the novel. The serum transforms the Dauntless into hypnotized soldiers to attack Abnegation. Tris and Tobias' Divergent abilities allow them to escape to the Abnegation compound. Tris is shot and they are captured. Erudite leader Jeanine, mastermind of the attack, injects Tobias with an experimental serum that overrides his Divergence. Under Jeanine's control, Tobias oversees the attack from the Dauntless control room. Tris is almost drowned in a tank, but is rescued by her mother, who reveals she is also Divergent before she is killed helping Tris escape. Tris is forced to kill Will, who attacks her under the influence of the simulation. She finds her and Tobias' fathers, explaining the truth behind the attack. They fight their way to Dauntless headquarters, where Tris' father sacrifices himself. Tris is attacked by the mind-controlled Tobias; unable to kill him, Tris surrenders, causing Tobias to break free of the serum's control. They shut down the Erudite simulation and free the Dauntless. They rejoin the initiates, and board a train to the Amity sector to find the Abnegation survivors. Many reviewers stated that the novel's writing style offers a distinctive, terse prose that creates a fast-paced reading experience. Susan Dominus, writing in The New York Times described the style as "brisk pacing, lavish flights of imagination and writing that occasionally startles with fine detail". Abby Nolan, from The American Prospect, noted that Divergent follows the structural and stylistic patterns of The Hunger Games and Blood Red Road. As in other children's and young adult fiction, the novel probes placement of authority and identity within the youth's relationship to parents and other social forces. Critic Antero Garcia describes the thematic similarity between these dystopian novels as an interest in the "grasp of power between youth and adult authority" and compared the novel to Unwind by Neal Shusterman. In The New York Times, Susan Dominus stated that Divergent "explores a more common adolescent anxiety--the painful realization that coming into one's own sometimes means leaving family behind ideologically and physically". The Voice of Youth Advocates agrees, writing that Divergent shows the pressure of "having to choose between following in your parents' footsteps or doing something new". Critic Antero Garcia compared the thematic interest in the characters being "forced into limiting constraints of identity and labor associated with their identity" to similar interest in forced identities and labor in the dystopian children's novels Matched by Allyson Braithwaite Condie and The Maze Runner by James Dashner. Government division of its population into fragmented communities is a frequent device in young adult (YA) and children's fiction. YA classics such as Lois Lowry’s The Giver, Monica Hughes’s The Dream Catcher, and Zilpha Snyder’s Green Sky Trilogy use this device to different ends. In her masters thesis, Ashley Ann Haynes describes fractioning of societies within Divergent as a supporting comparison with Hunger Games. Unlike the latter, however, each person can choose which faction they want to join, so long as they follow the rules and pass the tests. Divergent adds a new layer of complexity with its creation of an illusion of democracy for participants in its fractioned society, with the factions controlled by outside forces. The basis of the social structure in Divergent is that each faction fulfils a role in society. If one cannot contribute to society, they are cast aside to become "factionless" and are deprived of access to an identity and resources. In a journal article, Andrea Burgos-Mascarell compares the factionless to illegal immigrants, as they do not have access to certain public services either. Both are marginalised from society because they are unable to contribute to it. Some reviews criticize the lack of depth and realism of the social structures within the novel. Kirkus Reviews called the social structure a "preposterous premise". Booklist called the structure a "simplistic, color-coded world [that] stretches credibility on occasion". In a review for the University of Wisconsin-Whitewater's student newspaper Royal Purple News, Abrielle Backhaus notes how the "entire system seems insubstantial" and asks rhetorically "How could it be possible for any individual, with his or her infinite emotions and experiences, to be condensed to one single quality to tolerate for the rest of their lives and to choose at the mere age of 16?" In an interview Roth describes the social structure to have expanded from her initial conception, adding Candor to fill "a gap in the reasoning behind the world that needed to be filled". Social structure most affects the novel's themes by socially dividing different knowledge types that characters can access. In her book chapter exploring how literacy in different knowledge types affects the series, Alice Curry describes the factions, and character indoctrination in those factions, as deliberately creating knowledge gaps between initiates to different factions. Because of the initiation process, the characters become illiterate in the knowledge valued by the other factions. Tris's "divergence" allows her to be successful because she can become literate in a broad set of knowledges and information types, and thus she becomes more admirable to the reader. Curry argues that Jeanine's leadership within Erudite represents an academic ivory tower that alienates other types of knowledge, thus the book critiques academic learning, in favor of the broader knowledge embodied by Tris. Curry compares the novel to Julie Bertagna's 2002 Exodus, describing both as using spaces and landscapes where knowledge is learned to critique "crumbling knowledge institutions", like academic spaces, that "dissemble" knowledge instead of facilitating deeper holistic knowledge literacies that create "understanding". Like The Hunger Games, Divergent depicts considerable violence for a Young Adult novel. The Publishers Weekly review emphasized this stylistic choice, calling it "edgy" and describing the initiation rituals that Tris endures "as spellbinding as they are violent [requiring] sadistic tests of strength and courage". But, as Susan Dominus points out, the novel does not keep this violence at the forefront of reader experience; she writes in The New York Times, that "Terrible things happen to the people Tris loves, yet the characters absorb these events with disquieting ease. Here, somehow, the novel's flights from reality distance the reader from the emotional impact that might come in a more affecting realistic (or even fantasy) novel." When describing her inspiration for the Dauntless training their initiates through exposing them to their fears, Roth, in an interview for the website "PopSugar", says, though influenced by many sources, the most important was her "Psych 101 my first year of college [where] I learned about exposure therapy, which is when they treat people with fear, like for anxiety. It exposes them repeatedly to what they're afraid of, and gradually you become less afraid of it, or have a healthy level of fear, and I thought of the Dauntless then, because they're conditioning perfectly normal people to get over perfectly rational fears." Daniel Kraus's Booklist review of the novel described the intense psychological pressure as like "akin to joining the marines" but also providing the "built-in tension" that makes the novel a compelling read. Though the novel does not maintain an overtly Christian thematic interest, some readers place the novel's themes within this context because of Roth's professed religiosity. In the postscript "Acknowledgements", Roth emphasizes her Christian faith saying "Thank you, God, for your Son and for blessing me beyond comprehension." For some reviewers this element of Roth's lifestyle is important to the novel's impact; for example, when reviewing the novel for the Christian Ministry "Break Point", Sherry Early describes Roth as "a Christian" and the novel setting as "post-feminist, maybe even Christian". She also says that though the novel is "not overtly Christian", it follows a "Christian point of view" because it "fight[s] against the restrictions placed upon her by a controlling and totalitarian state" and because "Tris must also explore the cracks and imperfections within her own psyche." K. B. Hoyle also acknowledges that the novel would have a "Christian message", when reviewing it for the Evangelical book review organization The Gospel Coalition. However, Hoyle criticizes the novel for using profane terminology and for never "clarify[ing] what the practices are supposed to mean". Reviewers outside the Christian community have also noticed the Christian context of the novel. In a review of the book and first movie, David Edelstein observed the book's treatment of intellectuals as following a tendency in Christian culture to question genetic modification and majority: the intellectual Erudite faction are largely depicted as control-hungry villains pitted against the Abnegation faction, who are depicted as righteous and merciful. He wrote "The novelist, Veronica Roth, reserves her loathing for the 'Erudites', who spend their days in intellectual pursuit," and that the trend of intellectualism (thinking without feeling) "makes people apt to seize power and impose Maoist-like uniformity on entire populations — on pain of death." Divergent has received mostly positive reviews. In a review in The New York Times, Susan Dominus wrote that it was "rich in plot and imaginative details", but also that, compared to other such books in the same genre as the Hunger Games trilogy, it did "not exactly distinguish itself". In a review for Entertainment Weekly, Breia Brissey said that it was "flimsier and less nuanced" than The Hunger Games but was good, giving it a B+ rating. Similarly, though critiquing the "simplistic, color-coded world", Booklist reviewer Daniel Kraus positively concluded that the novel was full of "gutsy action and romance" and called it a "spin on Brave New World". Kirkus said it was "built with careful details and intriguing scope". Common Sense Media commented on the book's "deep messages about identity and controlling societies" and on the "unstoppable plot that's remarkably original". It was rated 5 out of 5 stars and given an age 13+ rating. The book debuted at number six on The New York Times Children's Chapter Books Best Seller list on May 22, 2011, and remained on the list for 11 weeks. It also spent 39 weeks on the Children's Paperback list in 2012, reaching number one. The Times changed its Children's Best Seller lists in December 2012, eliminating the Children's Paperback list and recognizing "middle grade" and "young adult" books separately; Divergent continued its run on the new Young Adult Best Seller list. The novel stayed on the list for 47 weeks until November 3, 2013. According to Publishers Weekly, the combined three volumes of the Divergent series sold over 6.7 million copies in 2013 (three million hardcovers, 1.7 million paperbacks, and just under two million e-books). In the lead up to the release of the film adaptation, Roth's novel topped USA Today's Best-Selling Books list in January 2014. Divergent won Favorite book of 2011 in 2011's Goodreads Readers Choice Awards, and won the senior category of the 2014 Young Reader's Choice Award. It was also number one in the Teens' Top Ten Vote, sponsored by YALSA. Shailene Woodley (left) and Theo James (right) play Tris and Four respectively in the film adaptation of the novel. Summit Entertainment bought the rights to film an adaptation of the novel in 2011. Summit recruited Neil Burger to direct. Initially, Summit gave the film a budget of $40 million, but Lionsgate later increased it to $80 million (which finally changed to $85 million) due to the success of The Hunger Games. Shailene Woodley was chosen to star as Beatrice "Tris" Prior. The role of Tobias "Four" Eaton eventually went to Theo James after an extensive search. Kate Winslet was signed as Jeanine Matthews. Also recruited into the cast were Maggie Q as Tori, Zoe Kravitz as Christina, Ansel Elgort as Caleb, Miles Teller as Peter, Ashley Judd as Natalie Prior, Tony Goldwyn as Andrew Prior, and Jai Courtney as Eric. Filming began in Chicago on April 16, 2013, and concluded on July 16, 2013, with nearly all filming taking place in Chicago. The film was released March 21, 2014, earning $150,947,895 in North America, and $137,228,004 in other areas, for a worldwide total of $288,175,899. The critic aggregating sites Rotten Tomatoes and Metacritic both noted the films mixed reviews. However, audience surveyor CinemaScore showed that audiences were very receptive to the film. ^ According to ISFDB a 2011 Australian printing, with apparently identical cover, credits the jacket art and design to Joel Tippie. But it credits other components, too, and "the cover seems to be a collage of multiple images including the not-seemingly-credited skyline." ^ a b c d e Divergent Universe series listing at the Internet Speculative Fiction Database (ISFDB). Retrieved March 24, 2014. Select a title to see its linked publication history and general information. Select a particular edition (title) for more data at that level, such as a front cover image or linked contents. ^ a b "Divergent". Library of Congress Catalog Record (LCC). Retrieved March 24, 2014. ^ a b c d e Dominus, Susan (May 15, 2011). "Choose Wisely". The New York Times. Retrieved May 14, 2013. ^ Christopher Borrelli (October 22, 2013). "The next YA superstar?". Chicago Tribune. Retrieved October 23, 2013. ^ Truitt, Brian (March 29, 2012). "Exclusive trailer and interview: 'Insurgent' by Veronica Roth". USA Today. Retrieved April 12, 2012. ^ a b c Kirsch, Becky (October 16, 2013). "Divergent Author Veronica Roth Says "All the Pressing Questions That You Have Will Be Answered" in Allegiant". Popsugar. Retrieved November 13, 2014. ^ Nolan, Abby (March 15, 2012). "The American Prospect". The American Prospect. Retrieved May 16, 2013. ^ a b Garcia, Antero (October 11, 2013). "Chapter 3: Outsiders?". Critical Foundations in Young Adult Literature: Challenging Genres. Sense Publishers. pp. 71–72. ISBN 978-94-6209-396-6. ^ Burrit, Devin. "Roth, Veronica. Divergent". Voice of Youth Advocates. Retrieved May 16, 2013. ^ a b c Haynes, Ashley Ann (2014). The Technology Question: Adolescent Identities of Home in Dystopic Young Adult Literature Post-Hunger Games (Masters). Iowa State University. pp. 24–38. Retrieved November 16, 2014. ^ Burgos-Mascarell, Andrea (2016). "Dystopia deconstructed: Applying the triple helix model to a failed utopia". Journal of Business Research. 69 (5): 1845. ^ a b "Divergent". Kirkus Reviews. April 15, 2011. Retrieved December 28, 2012. ^ a b c Kraus, Daniel (March 1, 2011). "Divergent". Booklist: 56. Retrieved November 19, 2014. (Subscription required (help)). ^ Backhaus, Abrielle. "Book Review: Divergent". Royal Purple News. Retrieved March 27, 2014. ^ a b c d e Curry, Alice (2013). "Knowledge: Navigating the Visual Ecology—Information Literacy and the 'Knowledgescape' in Young Adult Fiction.". (Re) imagining the World. Springer: Berlin Heidelberg. pp. 15–26. ISBN 978-3-642-36760-1. ^ "Children's Book Review: Divergent by Veronica Roth., HarperCollins/Tegen, $17.99 (496p) ISBN 978-0-06-202402-2". Publishers Weekly. May 1, 2011. Retrieved March 25, 2014. ^ Roth, Veronica (2011). Divergent. Katherine Tegan Books (HarperCollins). p. Acknowledgements. ^ a b c Hoyle, K. B. (2014). "Review: Divergent Trilogy". Book Reviews. The Gospel Coalition. Retrieved March 27, 2014. ^ a b Early, Sherry (July 7, 2011). "Review: Divergent by Veronica Roth". Break Point. Archived from the original on March 27, 2014. Retrieved March 27, 2014. ^ a b Edelstein, David (March 21, 2014). "Edelstein on Divergent: Entertaining, If You Ignore the Subtext". Retrieved April 2, 2014. ^ Dominus, Susan (May 12, 2011). "In This Dystopia, Teens Must Choose Wisely". The New York Times. Retrieved December 28, 2012. ^ Brissey, Breia (June 24, 2011). "Divergent". Entertainment Weekly. Retrieved December 28, 2012. ^ Angulo Chen, Sandie. "Divergent". Common Sense Media. Retrieved December 28, 2012. ^ "Best Sellers for the week ending May 7, 2011". The New York Times Book Review. May 22, 2011. Retrieved March 26, 2014. ^ "Best Sellers for the week ending in July 31". The New York Times Book Review. July 31, 2011. Retrieved November 16, 2014. ^ "Best Sellers for the week ending in December 09". The New York Times Book Review. December 9, 2012. ^ "Best Sellers for the week ending August 26, 2012". The New York Times Book Review. August 26, 2012. Retrieved November 16, 2014. ^ Yin, Maryann (December 6, 2012). "NYT Creates Separate Middle Grade & YA Bestsellers Lists". GalleyCat. Retrieved June 28, 2013. ^ "Best Sellers". The New York Times Book Review. The New York Times. December 16, 2012. Retrieved November 16, 2014. ^ "Best Sellers". The New York Times Book Review. The New York Times. November 3, 2013. Retrieved November 16, 2014. ^ Roback, Diane (March 14, 2014). "Facts & Figures 2013: For Children's Books, Divergent Led the Pack". Publishers Weekly. Retrieved November 16, 2014. ^ Deutsch, Lindsay (January 2, 2014). "Veronica Roth's 'Divergent' is No. 1 for the first time". USA TODAY Network. Retrieved November 16, 2014. ^ "Winners of the 2011 Goodreads Choice Awards". Goodreads.com. Retrieved March 6, 2013. ^ "Goodreads Choice Awards Announced; Divergent Voted Favorite Book of 2011". Retrieved September 3, 2013. ^ "2014 Young Reader's Choice Award Nominees and Winners". Young Reader's Choice Award. Retrieved 23 January 2015. ^ "Divergent leads list of teens' Top Ten". American Library Association Magazine. Retrieved May 14, 2013. ^ "Summit Entertainment's Post-'Twilight' Plans Are 'Divergent'". Retrieved June 6, 2013. ^ White, James (August 23, 2012). "Neil Burger Wants To Be Divergent". Empire. Retrieved May 24, 2013. ^ Ratny, Ruth L (January 8, 2013). "$40mm sci-fi "Divergent" starts filming here in April". The Reel Chicago. Retrieved June 8, 2013. ^ Vlessing, Etan (March 13, 2013). "Analysts Boost Lionsgate Price Target on 'Ender's Game', 'Divergent' Prospects". The Reel Chicago. Retrieved June 8, 2013. ^ a b Siegel, Tatiana; Kit, Borys (March 15, 2013). "'Downton Abbey's' Theo James Nabs Male Lead in Summit's 'Divergent'". The Hollywood Reporter. Retrieved June 28, 2013. ^ a b Schillaci, Sophie (May 15, 2013). "'Divergent': Shailene Woodley Braves Initiation in New Film Still (Photo)". The Hollywood Reporter. Retrieved June 6, 2013. ^ Kit, Borys; Siegel, Tatiana (March 11, 2013). "Maggie Q, Zoe Kravitz and Ansel Elgort Join 'Divergent' (Exclusive)". The Hollywood Reporter. Retrieved March 11, 2013. ^ West, Kimmy (April 26, 2013). "Picture and video from 'Divergent' movie set in Chicago: Houses in Abnegation? What do you think this is?". Page to Premiere. Archived from the original on May 18, 2013. Retrieved May 24, 2013. ^ Vilkomerson, Sara (April 24, 2013). "First Look: Shailene Woodley faces knives in 'Divergent' -- EXCLUSIVE PHOTO". Entertainment Weekly. Retrieved May 24, 2013. ^ Shaw, Lucas (July 18, 2013). "Comic-Con 2013: Shailene Woodley Says 'Divergent' Is Not a Superhero Movie". The Wrap. Retrieved July 20, 2013. ^ "Divergent (2014)". Box Office Mojo. IMDB. March 21, 2014. Retrieved October 2, 2014. ^ "Divergent (2014)". Rotten Tomatoes. Flixster. Retrieved May 2, 2014. ^ "Divergent: Reviews (2014)". Metacritic. CBS Interactive. Retrieved March 17, 2014. ^ Cunningham, Todd (March 23, 2014). "'Divergent' Scores $56 Million Box-Office Opening, 'A' CinemaScore – And a Franchise Is Born (Video)". The Wrap. Retrieved March 24, 2014. "Summit Signs Scribe for 'Divergent' Adaptation (Exclusive)". Pamela McClintock. The Hollywood Reporter. June 8, 2011. "The Scary Future, the Embarrassing Past" (review). Meghan Cox Gurdon. The Wall Street Journal. May 14, 2011. "Book review: Divergent". Debbie Phillips. Ballina Shire Advocate. July 14, 2011. This page was last edited on 28 March 2019, at 01:30 (UTC).